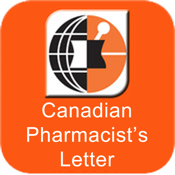 Most pharmacists Canada and the US subscribe to Pharmacist’s Letter. Every day thousands of pharmacists rely on the unbiased advice and recommendations in Pharmacist’s Letter...and now, the same advice and recommendations are available to you in this Free App. Pharmacist’s Letter gives you unbiased advice and recommendations you can trust on new developments in drug therapy. When you need the details, you can get them in the Detail-Documents, Patient Handouts (now available in English and Spanish), Drug and Dosage Comparison Charts, and Treatment Guidelines. Plus, you get CE credits while you read the Letter and Detail-Documents. Pharmacists rave about the practicality of the CE questions, and appreciate how what they learn can be used in practice right away. Pharmacist’s Letter /Therapeutic Research Center is approved by the Accreditation Council for Pharmacy Education (ACPE) as a provider of continuing pharmaceutical education. Pharmacist’s Letter is still 100% objective and unbiased...this remains unchanged after 25 years. No endorsements are allowed...no advertising is accepted...nobody has accepted one dime to say or promote anything in Pharmacist’s Letter. The editors are not even allowed to own stock in any drug company. Get access to one monthly article and its time-saving recommendations from Pharmacist’s Letter, plus the details from the Detail-Document, Patient Handout, Drug/Dosage Comparison Chart, or Treatment Guideline. Subscribers to Pharmacist’s Letter get full access to Pharmacist’s Letter with this FREE app. You get the full monthly issue (12-15 of the most pertinent recommendations each month), plus answers to all of your drug therapy questions in the browsable archives. The Pharmacist’s Letter App provides you the same benefits and ease of use that you've come to expect from the PharmacistsLetter.com website. You will be prompted to enter your login information (email address and password, or CE ID #) one time after downloading the FREE App.